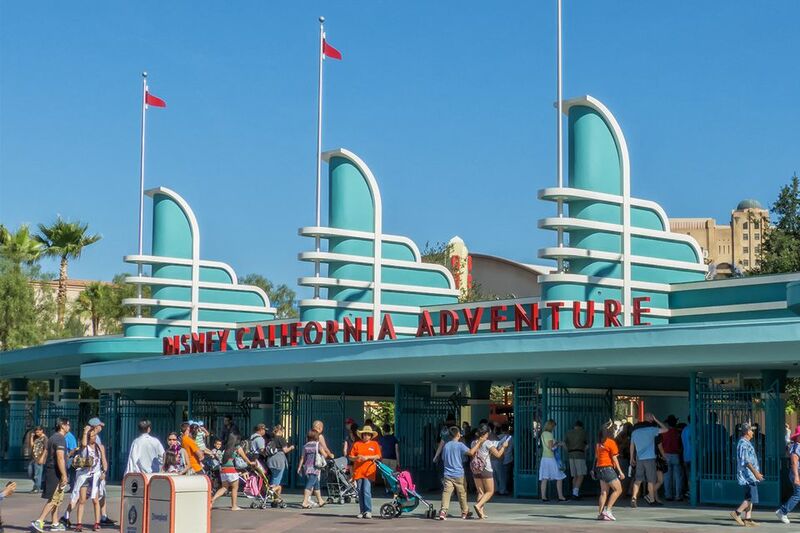 These tips will help you have a great time at Disney California Adventure theme park located at Disneyland Resort in Anaheim, California. These practical tips can help you save time and money and make the most of your visit. Also helpful is pre-planning information for your trip to Disneyland Resort with tips for packing and additional preparations your trip to both Disneyland and Disney California Adventure. Entertainment at Disney California Adventure ranges from shows like Frozen – Live at the Hyperion to parades, fireworks, and the stunning nighttime World of Color. Getting a good spot or getting into the shows is important to your overall experience. Watching World of Color: World of Color, a 22-minute extravaganza starting at 10 p.m. is a must-see. Jets of water shoot into the air, a laser show lights up the night and fireworks explode in an impressive display of brilliant color, all set to music. Fastpasses will help you make sure you get a spot. If you want to see the second show (when they have one), get your Fastpass later in the day. To get a better viewing spot, you can get a dining package that includes priority seating. Seeing the Parade: When there is a parade, you can see it almost anywhere along its route. If you plan to leave the park immediately after the parade, watch it near Carthay Circle and you can beat the crowds headed for the exit. Enjoying the Frozen Show: Frozen is a Broadway-style musical show based on the popular animated film. To get the best seats, pick up a Fastpass but plan to arrive early for the best seats. You can also add to your experience with a pre-show package. While you can spring for a VIP Tour and pass, there are quite a few things that you can do that allow you to feel like a VIP. You can get into California Adventure early. The program has various names like magic morning or early entry. The details change, but you may get it by staying at a Disney hotel, a Good Neighbor hotel and sometimes with multi-day tickets. Buena Vista Street often opens 30 minutes before the rest of Disneyland park. You can eat breakfast, shop, grab a cup of Starbucks or pose for photos with the characters before the rest of the attractions are open. You can stay at California Adventure after the official closing time, and you don't need VIP status to do it. Just get into any ride line a few minutes before the official closing is announced. You can stay until your ride is finished, no matter how long it takes. You absolutely must watch your timing for this one—be late to the line by even a couple of minutes and a cast member will nicely but firmly turn you away. You can stay late for shopping, too. The shops on Buena Vista Street stay open after park closing time. They will be packed with people who also put off their purchases to the end of the day, so it's probably best to make your selections earlier and be ready to pay for them right away. You don't have to be a VIP to get someone else to take care of your purchases. If you're staying at one of the Disney hotels, you can ask to have your packages delivered to your room. Otherwise, you have them put on hold for you to pick up later. Knowing where you want to go and developing a strategy for getting to your preferred shows and rides starts with a good map. Services, restaurants and restrooms are also more easily located with a map. Stop By the Chamber of Commerce and Guest Relations are on the left shortly after you get inside. That's where you can pick up a button for your special occasion. They can also help you with a multitude of questions and issues, including getting an access pass if you have mobility issues. They have maps and lists of attractions. First Aid is next to Chamber of Commerce on Buena Vista Street. You can park medications there that need to be refrigerated or get a band-aid or over-the-counter remedies for other minor mishaps. The Baby Care Center isn't as well known as it might be, judging from the number of moms seen struggling to take care of their little ones around the park. It's next to Ghirardelli and across from The Bakery Tour in Pacific Wharf. They have quiet places to change a diaper, rock a cranky baby, or nurse in a more private setting. They even have microwaves for heating baby food. If your phone battery is running down from all the texting, game playing, taking photos and posting to social media, you can rent a charging locker. Or, try this list of electrical outlet locations where you can charge for free. If you packed too much in your backpack and now regret it, find a locker. Regular lockers are on the right just inside the entrance. More lockers are outside to the left of the Disneyland entrance. California Adventure is a no smoking area, except for the places on this list so those who indulge can be prepared. If you lose something, there is a Lost and Found. Lost and found is outside the main Disneyland gates on the left. It's good to have a pre-planned rendezvous point for your family or group. Children should wait for their lost parents at the Baby Care Center in Pacific Wharf next to Ghirardelli. Walt Disney statue in front of Carthay Circle: Let your party know to meet here. You can watch people while waiting for your group to assemble and take a selfie with Walt too. Starbucks near Carthay Circle has lots of places to sit down and wait. And you can pick up a copy of the Buena Vista Bugle to read. There are places to grab a bite and some recommended restaurants to relax over a meal. Carthay Circle is California Adventure's fine dining spot. The most popular things on their menu are the Signature Fried Biscuits, stuffed with white cheddar cheese and bacon. Flo's Cafe is 1950s style diner in Cars Land that's much fun that you might not care what you eat. Try their milkshakes and homemade pies for a double dose of sugar-fueled energy. Alcoholic drinks are available in some parts of Disney California Adventure. Carthay Circle restaurant has a nice downstairs bar and the Wine County Trattoria serves wine. You can get a beer in the food area near Paradise Pier or a mixed drink at the Cove Bar behind Ariel's Grotto. Don't expect to be carrying those adult beverages around the park, though. They have to be consumed where you bought them. This is where a map will come in handy again. There are ways to save time and steps if you know where to go. Use the streetcar to save some steps between Carthay Circle and the Tower of Terror. Shortcut to Cars Land: Go through the patio at Pacific Wharf and walk through the rock arch. You'll enter Cars Land next to Radiator Springs Racers and get a gorgeous view that looks like a scene from the movie. Alternate Entrance: There's a side entrance into California Adventure from the Grand Californian Hotel. To get to it, exit the lobby and go past the Napa Rose restaurant. During busy times, you will have to show a room key to use it for entrance, but anyone can exit there, and it's a good shortcut if you're going to Downtown Disney or one of the other Disney hotels. To get the most fun out of California Adventure, you need to get into the details. These are a few of the ones that may be useful or interesting. The windows on Buena Vista Street have lots of names on them. It's fun to check them all out and even more fun to know that they all honor real people, who are former employees or friends. The addresses on Buena Vista Street mean something, too. The first two digits of all the addresses (26 or 27) refer to two of the years that the Walt Disney Studios were located on Hyperion Avenue in Los Angeles. The second two digits often, though not always, correspond to a milestone year in the history of the Studios. For example, the address of Julius Katz Shoe and Watch Repair is 2701 Buena Vista Street, representing the year of Walt Disney’s birth—1901. In Oswald's, the radio plays music from the 1920s so authentic-sounding that you might think you've fallen into a time warp. Hidden Mickeys are something you hear about everywhere. All it takes is three circles to create the iconic mouse silhouette. There's even a book to help you find them. It's fun to look around for the mouse logos. Grizzly River Run is the wettest ride at the Disneyland Resort. The Imagineers made it that way on purpose. To keep your belongings from getting wet, use the free lockers near the ride entrance. Where to Rest: You could just lay down on a bench and catch a few winks, but that may be a bit too public. The Frozen show at the Hyperion Theatre is air-conditioned and lasts quite a while and its ok if you nod off. The Animation Studio has a seating area in the middle, where you can watch clips from Disney cartoons while you rest. Cars Land lights up at sunset. Find the current sunset time on one of your cell phone apps or check it before you leave home. Be in front of Flo's Cafe about 10 minutes before then and wait for the magic. Check out the radios inside Oswald's Service Station. They play music. You can get free food samples. If you take the tour at Boudin's, you get a sample of their luscious sourdough bread. The California Adventure Ride Guide gives you even more tips for enjoying the rides.